As a recap, I enrolled in Jason Dulay's VA Bootcamp last November 21 and started taking the modules on November 23. You can check it out >>here<<. I have done modules 1-5 and there are eight (8) more to go to finish the Virtual Assistant boot camp and proceed to the Accelerated Lessons. 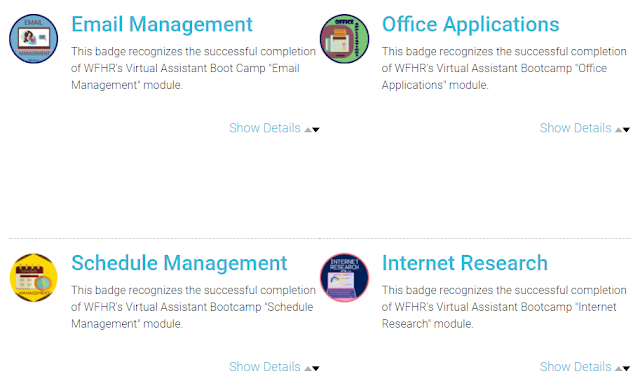 With the five (5) modules I completed, I was able to obtain four (4) Credly badges [because the first module is just an introduction]. Credly, as per their LinkedIn profile, is a leading digital credential service provider, helping the world recognize lifelong achievement with the most popular platforms for verifying, sharing and managing digital credentials and badges. The enterprise-class system allows organizations to officially verify skills and competencies; distribute portable and secure digital credentials and open badges; and gain actionable data and insights. Thousands of education institutions, industry associations, employers and workforce development programs use Credly to make achievements visible. In other words, Digital credentials are the digital equivalent of paper-based credentials. And Digital badges are a form of digital credential that indicate an accomplishment, skill, quality or interest, which is what I get in completing the modules in the boot camp. It is like telling the clients online that you have these certain skills and your Credly badges are there as a proof of that. A 100% / perfect score is needed in the quiz to obtain the badge. No need to worry though since the questions are taken from the video lessons. I am currently taking the 6th module which is about WordPress Management and I am excited about it. I still do not know how to use the skills I learned in landing an online job but I just need to keep learning, take the lessons every free time I get and I believe I will figure that out as I progress with the course. So 'till then, I will have to absorb everything I can and practice it. By the way, tomorrow is the Christmas party for WFHR students and FLIPpers [I guess?]. That will be a good time to meet other students who will be coming from different parts of the Philippines [Luzon, Visayas and Mindanao] and successful freelancers/mentors as well. Unfortunately I won't be able to make it but I am still excited to see in their updates how the party will go.